Westland 'Garden Health' Aquatics Compost 20ltr Bag provides a combined sterilised soil & added grit compost mix for growing healthy aquatic plants. Aquatic Compost ensures a slow release of nutrients prevents leaching and greening of water, whilst the loam is vital for nutrient retention for the plants benefit. Added grit ensures good anchorage for underwater root systems made difficult by water movement. Specially formulated for healthy, strong aquatic plants encouraging good growth of submerged plants in garden ponds. Sterilised soil compost mix prevents unwanted blanket weed and aids purity of the water for other pond-life. 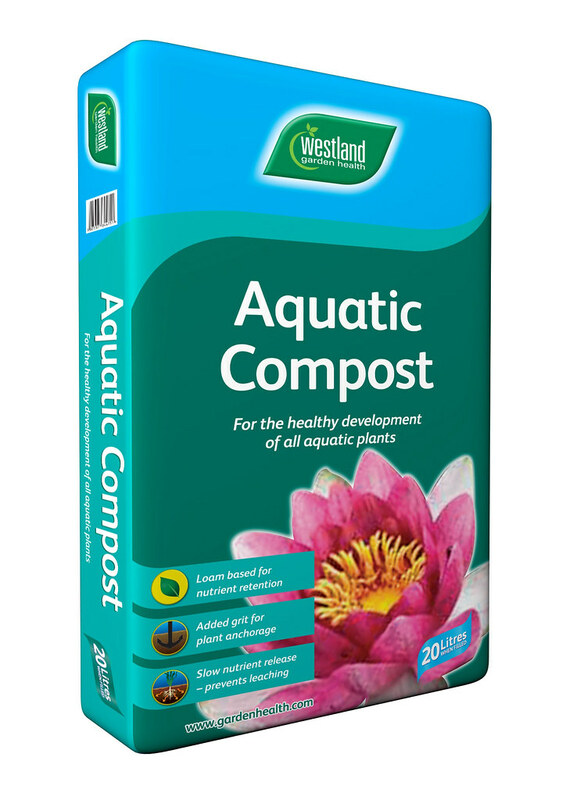 Suitable for both planting submerged plants, or potting and re-potting aquatic plants, the Westland Aquatic Compost contains a slow release balanced fertiliser for 4 weeks feed, complete with trace elements, ensuring a pH of 6.0-6.5.